Today we leave for Laos - Luang Prabang. We decided to fly as we'd heard so many bad stories about the long 32 hour bus journey from Vietnam to Laos. It cost us a lot more money, but saved us on time. 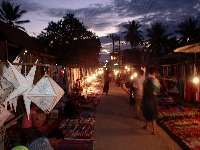 I LOVED Luang Prabang! Reminded me a lot of Hoi An, with it's cobbled streets and quant buildings. Lovely little shops dotted along side streets selling gorgeous jewellery and handmade textiles. The night market is out of this world!! Me and Lucy have now become pro market shoppers, we can't get anough of them!! Luang Prabang is THE best I have ever seen, the 3 rows of market line the long main street from 5 in the afternoon until 10pm. I confess to spending far too much, but I know I will probably never come back here, so I don't want to regret not buying some things. I could have bought everything, but when I physically couldn't carry anything else I had to restrain myself! After Luang Prabang, we moved ontoVang Vieng - TUBING TIME!!! Parents - you might want to skip this bit....Talk about health and saftey risks!! It doesn't exist out here, the whole concept of tubing is mental, but SO much fun! 6 bars line the river and the idea is that you float from one to another on an inflated tube in the watre, each bar throwing out a long piece of rope with a filled water bottle in the other end to grab onto and get pulled in. Lucy split her foot open on a sharp piece of rock getting out of her tube, so it's not the safest of places especially mixed with alcohol. We went tubing for 2 days, the 2nd for Lucy's 24th birthday - defnately a memorable day ( or maybe not)...when photos are put online you'll see how messy tubing can be, at each bar there is free spray paint and stenciling so everyone is covered from head to toe in silly motifs like ' I love Laos'. Some idiot decided to pick up a spray can and spray my whole back in purple..took days to get off! Randomly bumped into Emily's cousin out there and also a guy I studied foundation with - small world! I loved Vang Vieng, but couldn't spend a long time there as besides the tubing, there's not an awful lot to do. We spent one night in Vientiane before getting a bus to Chiang Mai. There's not much going on in Vientiane, a few nice restaurants and a small night market, but after one evening we'd had enough and wanted to move on.